Oxybenzone, despite the threat it poses to our bodies, is one of the most common filters found in chemical sunscreens. 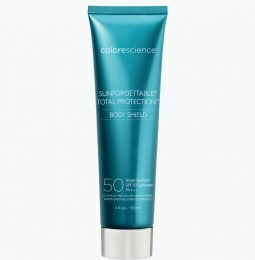 Colorescience offers sunscreen without oxybenzone to give you safe UV protection that you can trust. Choose our mineral sunscreen to avoid chemicals and protect yourself from the sun without exposing yourself to harsh, toxic ingredients. Oxybenzone is a toxic chemical found in commercial sunscreens. It forms readily soluble, colorless crystals with the primary function of absorbing UV light. However, oxybenzone is also absorbed by the skin and thereby enters the bloodstream where it stays for an unknown amount of time. Studies have found oxybenzone in blood, urine, and breast milk samples and have linked the chemical with endocrine-disruption and hormonal problems. Chemical sunscreens may also contain potentially dangerous, toxic filters such as octinoxate, octisalate, and homosalate. 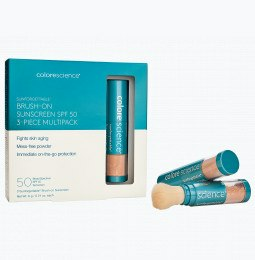 Avoid the risk all together by shopping sunscreen without oxybenzone or its counterparts and choose Colorescience physical sunscreen instead. Whereas chemical sunscreens absorb into the skin, physical or mineral sunscreens sit on the skin’s surface to physically diffract harmful UV rays. Our formula uses zinc oxide sunscreen and titanium dioxide sunscreen to filter UV light instead of relying on the use of toxic chemicals. 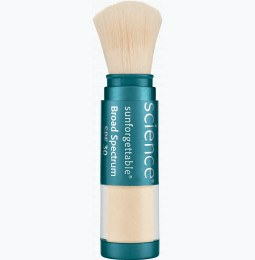 Applying sunscreen with zinc oxide and titanium dioxide is easy with Colorescience’s self-dispensing brush; all you need to do is sweep the brush in small, circular motions to release the powder 30 minutes before sun exposure for broad spectrum protection. Absolutely. We offer PABA free mineral sunscreen powder, and never include harsh chemicals or dyes that are known to trigger skin irritation. 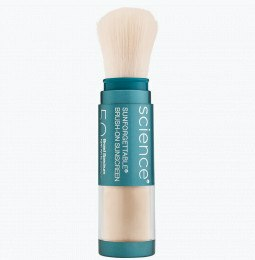 Our powder sunscreen for sensitive skin uses gentle ingredients and promises safe protection against the sun. 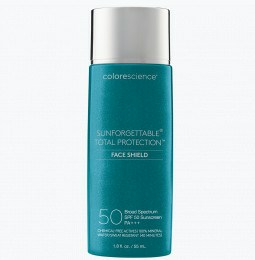 Use Colorescience face sunscreen with zinc oxide for a natural UV defense that’s free of harmful chemicals.